Whitley Bay’s Northern Promenade, was to be revamped as part of North Tyneside Council’s coastal regeneration programme. The project aim’s to transform the area into a hub of activity for people of all ages, with improvements including new seating, surfacing and shelters. Following a competitive tender process, the council appointed a consortium to develop a number of ideas for the stretch. The group included xsite architecture, designer-engineers Raskl, and design and branding experts Electrik Sheep Design. Between them the three firms, based in and around Newcastle city centre, have been responsible for award-winning projects such as the refurbishment of Hoult’s Yard and the Toffee Factory in Newcastle, the Tyne Salmon Trail public art commission for the Environment Agency and Enchanted Parks in Gateshead. 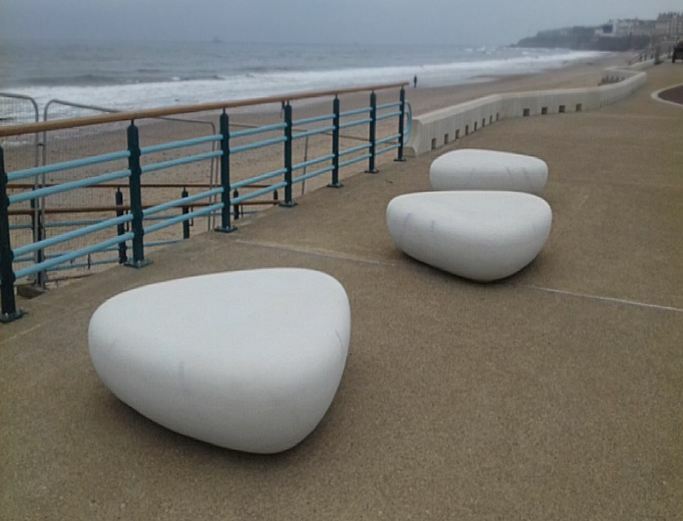 As part of the seating upgrade the designers looked at various modern designs, but wanted to incorporate the traditional British beachside views, therefore the option of being able to provide high quality, highly polished giant boul-ders, ticked all the boxes. The artists impressions used in the initial design formulation looked really good as do the actual Urbastyle Galet benches shown below, 6 of these were incorporated into the finished project. H S L on behalf of Bomax worked closely with Sey-mour Civil Engineering, giving detailed advice on health and safety, including technical data sheets on the mechanical handling requirements for the Urbastyle Galet benches. The Urbastyle Galet 6 bench was supplied by Bomax through the sub contractors preferred distributor Civils and Lintels. The overall success of the Promenade upgrade has had a positive effect on the locals and visitors to Whitley Bay, and been very well accepted by the client .